Continuing professional education requirements for CPAs. The Arizona State Board of Accountancy (Board) held its annual meeting at the Arizona Society of Certified Public Accountants (ASCPA) on August 23 and 24, 2018. The meeting was well attended by many of the Board’s advisory committee members. The Board received a presentation from Cindie Hubiak (President and CEO) and Michael T. Allen (Board Chair) of the ASCPA, reports from the Board’s advisory committees, and engaged in a thorough discussion regarding disciplinary guidance, the Board’s FY 2020 budget request and the Master List of State Government Programs, and Substantive Policy Statement #2018-001, amongst other topics. The Board also recognized various professionals who have volunteered their time and effort to help the Board fulfill its mission to protect the public from unlawful, incompetent, unqualified or unprofessional certified public accountants through certification, regulation and rehabilitation. Below is a list of all members of the Board and its advisory committees who were recognized for their dedicated service to the Board, the CPA profession and the public. LeRoy M. Gaintner was recognized for his tenure and leadership on the Board. Four professionals who will no longer be serving on their respective Committees, Joe Epps, Jo-Ann M. Humphrey, Sean Kindell, and Todd Jason were recognized for their dedication and volunteerism. The Board expressed gratitude for their service and wished them the best in their future endeavors. Lastly, seven professionals were commended for their willingness to continue to serve on their respective advisory committees. The Board would not be able to fulfill its mission without the dedication of these outstanding and hard-working volunteers. Laws 2018, Chapter 268, SB 1443, which is effective August 3, 2018, is a collaborative work product of the Arizona Society of CPAs, the Arizona State Board of Accountancy (Board), and the Board’s Law Review Advisory Committee. SB 1443 reduces regulation, fosters lean government, improves customer service, and supports the Board’s mission to protect the public. The Board’s peer review rules have been amended to make them consistent with the American Institute of Certified Public Accountants’ (AICPA) peer review program. The AICPA peer review program subjects non-disclosure compilations to peer review, whereas, the Board’s rules did not. Rather, the Board’s rules subjected non-disclosure compilations to an Educational Enhancement Review (EER). The rules have been amended to repeal the EER process and make non-disclosure compilations subject to peer review. This change will make the Board consistent with 47 of the 54 states of the United States and its territories that require peer review of non-disclosure compilations. The new rule will also require that firms allow the peer review administering entity to make peer review documents accessible to the Board via the AICPA Facilitated State Board Access (FSBA). This will reduce the need for firms to provide results via hard copy to the Board. Additionally, the Board’s Professional Conduct rules have been amended to incorporate in part the American Institute of Certified Public Accountants (AICPA) Code of Conduct and Professional Standards (Code). Continuing Professional Education Standards were not incorporated by reference. The AICPA sets ethical standards for the profession and U.S. auditing standards for private companies, nonprofit organizations, federal, state and local governments. It is not efficient nor effective for the Board to promulgate its own standards, as these may be redundant or contradictory to the AICPA. The incorporation by reference of the AICPA standards reduces the regulatory burden while achieving the same objective by ensuring that the accounting community only has one set of standards by which it is regulated. More than 37 jurisdictions have adopted the Code in full or in part. Please note that both AICPA members and non-members will be subject to the AICPA Code of Conduct and Professional Standards. The Arizona State Board of Accountancy (“Board”) held its annual meeting at the Arizona Society of Certified Public Accountants on August 24 and 25, 2017. The meeting was well attended by several of the Board’s advisory committee members. 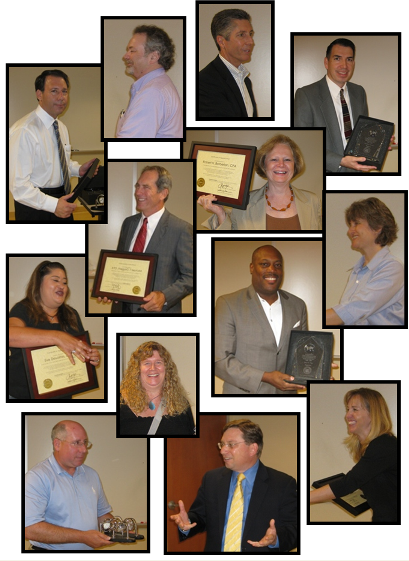 Twelve individuals were recognized for their service and contributions to the Board. Most of the service recognition recipients are certified public accountants (“CPAs”), who have volunteered their time and effort to help the Board fulfill its mission to protect the public from unlawful, incompetent, unqualified or unprofessional certified public accountants through certification, regulation and rehabilitation. However, this year, a member of Board staff, Mary Ramoz, was also recognized for her twenty-year anniversary with the Board. Her service in supporting the Board and its advisory committees has been indispensable and the Board expressed their appreciation and gratitude for her dedication and well-rounded institutional knowledge. Below is a list of all members of the Board, its advisory committees, and Board staff, who were recognized for their dedicated service to the Board, the CPA profession and the public. Layne R. Simmons was recognized for his tenure and leadership on the Board, and Douglas N. Kimball was commended for his service and continued support as the Board waits for an appointment from the Governor’s Office for a new public member. R. Gregory Blake was also congratulated for his long tenure with the Tax Advisory Committee, having served with the Committee since its inception back in 1991. Five of the nine committee members listed below will continue to provide outstanding support to the Board by renewing their commitments for another five-year term, respectively. While the Board and its staff will miss the service and expertise of Layne R. Simmons, Melinda A. Xanthos, Scott T. Wallace, John Cotton, and R. Gregory Blake, the Board and its staff also wish them well, but are equally grateful for each member who continues to serve and for each member who is added to this ever-growing list of dedicated volunteers. The Board would not be able to fulfill its mission without the dedication of these, and all the Board and advisory committee members, who are committed to protecting the public and educating the Arizona CPA community. Increased assessment of higher- order cognitive skills that include, but are not limited to, critical thinking, problem solving, and analytical ability. Additional task-based simulations (TBSs) will be included on the exam, which are an effective way to assess higher order skills. New exam blueprints containing approximately 600 representative tasks across all four Exam sections will replace the current Content Specification Outline (CSO) and Skill Specification Outline (SSO). These blueprints are more robust than the CSO and SSO, identifying content knowledge linked directly to representative tasks performed by newly licensed CPAs. Total CPA Exam testing time will increase from 14 to 16 hours – four hours for all four sections. The new Exam will retain the four existing sections – Auditing and Attestation (AUD), Business Environment and Concepts (BEC), Financial Accounting and Reporting (FAR), and Regulation (REG). For more information, see Next Version of the Uniform CPA Examination FAQs at the AICPA website. 8. AICPA: Providing Services to Businesses in the Marijuana Industry: A Sample of Current Board Positions. Under ARS 32-741, the Board may revoke or suspend a registrant’s certificate, take disciplinary action or issue a letter of concern for numerous causes that are enumerated therein and include, but are not limited to conviction of a felony, conviction of a crime with a reasonable relationship to the practice of accounting, dishonesty, suspension or revocation for cause of the right to practice before a governmental body or agency and other acts. Further, regulation R4-1-455.03 entitled Discreditable Acts states that a registrant shall not commit an act that reflects adversely on the registrant’s fitness to engage in the practice of public accounting which includes violating ARS Title 32, Chapter 6, Article 3 as well as various enumerated rules. The authorized sale of medical marijuana is legal in the State of Arizona and the State of Arizona has mandated that such sale be performed by licensed and regulated medical marijuana dispensaries. Further, the State of Arizona has mandated that to renew their license such medical marijuana dispensaries must retain a certified public accountant to perform an audit of the financial statements of such entity. The Arizona Board of Accountancy recognizes that while the state of Arizona has a law that legalizes the sale of medical marijuana, the Federal Government does not have such a law. As there is a dichotomy between Federal and Arizona law, the Arizona Board of Accountancy can make no determination of how such a conflict might ultimately affect a medical marijuana dispensary or any of its service providers. Hence, the Arizona Board of Accountancy has concluded that during the contemplation of acceptance of any accounting services engagement for a medical marijuana dispensary, an Arizona registrant should diligently evaluate and address the potential risks and uncertainties associated with providing such services. Registrants should carefully consider the criteria provided in auditing standards and other professional materials, as well as professional guidance specifically related to providing services to the medical marijuana industry. Further, the Arizona Board of Accountancy has concluded that merely accepting an engagement to provide accounting services to a medical marijuana dispensary does not, on its face, constitute an act discreditable to the profession and it will not pursue independent disciplinary action against an Arizona CPA registrant based solely on such acceptance. The Arizona Board of Accountancy recommends that Arizona registrants considering providing services to the medical marijuana industry read the materials referenced herein, professional standards applicable to the professional services to be provided and guidance offered by State and Federal regulatory bodies, including, but not limited to the Internal Revenue Service, the U.S. Department of Justice and the U.S. Securities Exchange Commission and any other authoritative materials available that frame the issues contemplated herein. Pursuant to A.R.S. §32-703(A), the primary duty of the board is to protect the public from unlawful, incompetent, unqualified or unprofessional certified public accountants or public accountants through certification, regulation and rehabilitation. Certified Public Accountants (CPA) and CPA firms are one of many professions and occupations regulated by various Arizona Boards and Commissions established to protect the public. These professions have enforced codes of practice that members of the profession must follow to prevent exploitation of the client and to preserve the integrity of the profession. This is not only for the benefit of the client but also for the benefit of those belonging to the profession. A.R.S. §32-701(24) defines “registrant” as any certified public accountant, public accountant or firm that is registered with the Arizona State Board of Accountancy. Registrants who perform auditing, review, compilation, management consulting, tax, or other professional services are required to comply with standards promulgated by various standard setting bodies such as the Financial Accounting Standards Board, Government Accounting Standards Board, Public Company Accounting Oversight Board, Auditing Standards Board, Accounting and Review Services Committee, or Tax Committee. The collection of standard setting bodies collectively define a standard of conduct. The role of the Arizona Board of Accountancy is to ensure that registrants meet these standards, by taking disciplinary action if they do not practice accordingly. This allows those registrants who act with conscience to practice in the knowledge that they will not be undermined commercially by those who have fewer ethical qualms and/or knowledge, skills and abilities. It also maintains the public’s trust in the profession, encouraging the public to continue seeking their services. In an effort to better fulfill its mission and protect the public, effective December 31, 2015, the Arizona Board of Accountancy will be posting disciplinary action to its website via its CPA Directory , to help the public who is looking to the Board for such information to make an informed judgement about who they want to engage with to provide services. While there is a wide array of disciplinary action from things intended to educate registrants to things that are intended to be punitive in nature, each consumer will be able to review the findings of fact, conclusions of law, and the associated discipline and make their own independent judgements about whether the posted discipline – past or present – is of concern to them and empower them with the appropriate information to act accordingly. Once-a-year, the Arizona State Board of Accountancy (Board) holds an offsite annual meeting to discuss its previous year’s accomplishments, statistics and strategic initiatives for the next year and to learn about emerging issues in the accounting profession. The Board was, again, thankful to the Arizona Society of Certified Public Accountants (Society) for the use of their space to hold the annual meeting. In addition to the Society’s presentation of its endeavors and concerns, the Board also received information from James Brackens, the Vice-President of Ethics and Practice Quality with the American Institute of Certified Public Accountants. Mr. Brackens’ presentation covered the near- and long- term initiatives of the CPA profession’s peer review program and the role of the Board’s Peer Review Oversight Advisory Committee. One of the favorite portions of the Board’s annual meeting is the award luncheon. The Board’s mission of protecting the public is supported through the dedicated efforts of the Board’s six advisory committees. Each committee has at least seven members, and each member serves in this advisory role – on a voluntary basis. Committee members who have served at least one five-year term are honored for their service to the Board during the award luncheon. This year was unique, because the Board honored a committee member, Gary Wood, who unexpectedly passed away in January. The Board presented Gary’s wife, Pamela Wood, with his service award. Gary’s passing has and will affect the CPA profession that he served since 1980. The Board expressed their gratitude to Mrs. Wood for her late husband’s service and dedication as a committee member and an investigator for the Board. The community lost a significant member in Gary. He helped shape how one should conduct himself – as a family man, a business man, and a public servant. Below is the full list of dedicated professionals who were recognized for their service at this year’s award luncheon. Many of these professionals will continue to serve in their respective roles for another five-year term. The Arizona Board of Accountancy, the Board’s Law Review Committee, and Board staff worked diligently to consolidate and clarify statutes related to firm registration, establish a process for firm reinstatement from cancelled or expired status, create a new path whereby a firm may relinquish its registration pending or in lieu of an investigation or a disciplinary proceeding or while under a disciplinary order and make other technical and clarifying changes. The following is a summary of the bill which has a general effective date of July 3, 2015. 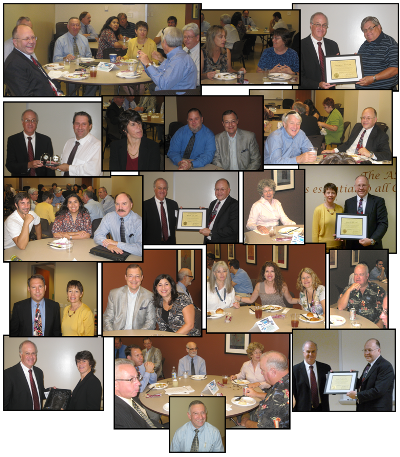 The Arizona State Board of Accountancy (“Board”) held its annual meeting, again, at the Arizona Society of Certified Public Accountants on August 28, 2014. The meeting was well attended by several of the Board’s advisory committee members. 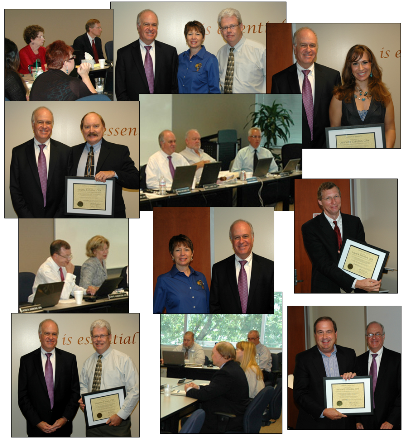 Fourteen Board and Committee members were recognized for their service and contributions to the Board. Most of the service recognition recipients are certified public accountants (CPA), who have a genuine and legitimate interest in their profession and the protection of the public. However, three individuals were recognized for the service to the Board who are not CPAs. Those three individuals are Anne L. Lynch, Roger L. Cohen and George J. Coleman. Their service and dedication, to a profession in which they are not a part of, speaks volumes as to how fortunate the Board is to have so many dedicated individuals protecting the public and furthering the strength of the CPA profession. Below is a list of all members of the Board and its advisory committees who were recognized for their dedicated service to the Board, the CPA profession and the public. Karen K. McCloskey’s service as a Board member will be missed, mostly because she was instrumental in reforming the Board’s statutes and rules. Nine of the 13 committee members listed below will continue to provide outstanding support to the Board by renewing their commitments for another five-year term, respectively. Notably, Robert H. Berberian just completed his 20th year as a Tax Advisory Committee member and is one of the nine who will be contributing his skills for another five years. While the Board and its staff will miss the service and expertise of James C. Sell, Gary L. Freed, William C. Heimerdinger and Michael J. Holt, the Board and its staff also wish them well, but are equally grateful for each member who continues to serve and for each member who is added to this ever growing list of dedicated volunteers. The Board would not be able to fulfill its mission without the dedication of these, and all the Board and advisory committee members, who are committed to protecting the public and educating the Arizona CPA community. The Arizona Board of Accountancy, the Board’s Law Review Committee, and Board staff worked diligently to review its statutes and make necessary improvements to better serve exam and certification applicants and registrants and to ensure an understandable regulatory framework. During the 2013 legislative session the Board passed Laws 2013, Chapter 136 (HB 2260). During the 2014 legislative session, Laws 2014, Chapter 136 (HB 2263) was passed primarily as a technical clean up trailer bill to HB 2260. The following is a summary of the bill which has a general effective date of July 24, 2014. IQAB, on behalf of state boards, established a process to evaluate qualifications of other countries using criteria comparable to those used to qualify U.S. CPAs for licensure. To accomplish this, a consensus must be achieved on principles of reciprocity, including education, examination and experience. Qualifying countries must provide sufficient evidence that their candidates meet those requirements. If consensus is met, an MRA is signed between representatives of the host country, the AICPA and NASBA. An important portion of the qualifying procedure for candidates from these countries is to test the applicant’s knowledge of accounting issues in the corresponding countries “body of knowledge.” IQAB established the testing tool known as the International Qualification Examination (IQEX). IQEX tests tax and accounting business law, which can vary widely between the applicant’s country and the U.S. Beginning in late 2012, IQEX became the Regulation (REG) section of the Uniform CPA Examination. The Board’s rules have been updated to reflect changes required due to the passage of Laws 2013, Ch. 136 HB 2260 ; to ensure that they accurately reflect operating practice; and to provide technical, clarifying, and conforming changes to improve the organization and readability of the rules for the regulated community. If you are interested in learning about the specific changes, the Notice of Final Rulemaking delineates the changes to the old rules by repealing language ( repealing language) and adding new language ( new language). If you would prefer to read a rule in its final form with all the incorporated changes, the rules can be found here. At its Annual meeting, the following members of the Arizona State Board of Accountancy (“Board”) and its advisory committees were recognized for their dedicated service to the Board, the CPA profession and the public. Mark Landy’s service with the Board, as a Board member will be missed, but not for long, because he has volunteered, once again, to serve on one of the Board’s many committees. His new role will be as a member of the Law Review Committee, who is responsible for the Board’s statutes and rules. In fact, Mr. Landy’s many years of service, not only as a Board member, but a member of the Certification Committee and the Auditing & Accounting Standards Committee will now serve the Law Review Committee well. All of the committee members listed below continue to provide outstanding support to the Board and their terms range from five years to a whopping 15 years of service. Notably, Sharon F. Erickson has served on the Tax Advisory Committee for the past 15 years and has just renewed her membership for another five-year commitment. In fact, like Ms. Erickson, all but two of the committee members listed below volunteered to renew their memberships for another five-year term on their respective committees. The renewing committee members are: Dominic Celico, Anne Cornelius, Todd Jason, Christopher A. Lutes, Nancy S. Maurer, Vicki L. Rios and Stephen J. Rodis. While the Board and its staff will miss the service and expertise of Jennifer Phillips and Laura Belval, the Board and its staff also wish them well, but are equally grateful for each member who continues to serve and for each member who is added to this ever growing list of dedicated volunteers. The Board would not be able to fulfill its mission without the dedication of these, and all the Board and advisory committee members, who are committed to protecting the public and educating the Arizona CPA community. The Arizona Board of Accountancy, the Board's Law Review Advisory Committee, and the Board staff worked diligently to review its statutes and make necessary improvements to better serve exam and certification applicants and registrants and to ensure an understandable regulatory framework. At its Annual meeting, the following Board and Advisory Committee members were recognized for their dedicated service to the Arizona State Board of Accountancy and to the CPA profession. Gary Fleming’s leadership and understanding of the Board’s role will be missed. While members of the Board are limited with their service to a five-year term, the Committee members continue to provide outstanding support to the Board with terms ranging from four years to 21 years of service. Notably, R. Gregory “Greg” Blake has served on the Tax Advisory Committee since its inception in 1991. In addition, two other Committee members, Stephen “Steve” T. Harris and Andreas “Andy” D. Coumides have served for 15 years on the Auditing & Accounting Standards Committee. All three have each been approved to serve another five-year term on their respective Committees. In fact, many of the other CPAs, like Laura G. Belval, Timothy R. Coffey and Michael P. O’Malley, recognized at this year’s annual meeting will continue to serve the Board and the CPA profession. Layne Simmons was a Tax Advisory Committee member and is the most recently Governor appointed member to the Board and his knowledge and experience on the Committee will transcend well into his continued service as the newly Governor appointed Board member. The Board would not be able to fulfill its mission without the dedication of these, and all the Board and Advisory Committee members, who are committed to protecting the public and educating the Arizona CPA community. 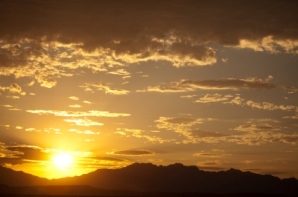 The Arizona State Board of Accountancy (Board) is pleased to announce the release of its portal which represents the exciting completion of the first of many milestones to modernize the Board’s operations and improve services to its customers. The portal, currently in its infancy, provides services for online renewals, and sole practitioner firm registration if applicable as part of the online renewal, as well as CPE tracking. The system currently can be used by registrants with full two year term renewals. The system cannot be used by registrants, who have recently been certified and have a prorated renewal period and prorated CPE requirements, however, the system is being enhanced to accommodate these registrants in the near future. The portal is being strategically designed as an online account that will be unique to each and every customer of the Board whether they are an applicant to sit for the uniform CPA exam, a certification candidate, or a registrant already regulated by the Board. As the Board continues its modernization efforts, the services in the portal will continue to grow. For example, in the future the portal will include other online applications or a quick and convenient place to update a name or address with a few simple steps. These changes help the Board work smarter and more efficiently, improve regulation, and provide a more flexible and convenient customer service experience. During the summer, CPAs will receive a letter with an account number and password which will require that the portal be used for renewals and CPE tracking. Please be patient if you learn that another CPA has received this information and you haven’t. The mailing will be a large endeavor for Board staff and may be staggered over several weeks to complete. The following delineates a few of the highlights of the new business processes that are both advantageous to the Board and its customers and provide a win-win solution. Provides customized forms that are dynamic based on individual responses. Take a break and continue at a later time as entries are saved as you go. MasterCard and Visa are accepted. Checks and cash are still accepted by mail or in person after the renewal is completed online and printed. E-file helps registrants avoid being late by ensuring instant delivery and by saving time from mailing or hand delivery. All available renewal options (e.g., inactive, fee and continuing professional education (CPE) waivers) are presented and fully described to help CPAs make the most informed decisions about their license. Built-in help is always available for further clarification or guidance without having to call, email or wait until the Board’s office is open. Of course, Board staff is available to provide personal assistance during business hours, if needed. The online renewal form integrates all the related forms that previously had to be downloaded separately, providing a one-stop experience. A confirmation receipt is emailed after the renewal is received and paid online. Immediate validation of requirements ensures that renewals are complete and accurate before the renewal can be accepted. Since the web based model is replacing the paper based renewal and Excel CPE reporting forms, all CPAs should access the portal and begin to track their CPE online even if their renewal won’t be due for some time. The biggest transition issue with changing business processes relates to CPE tracking, especially for those registrants whose renewals are due shortly and may have already used the Excel CPE form to record their CPE. The recording of CPE online is a one time transition issue but can be minimized for those CPAs that use the CPE List portal application sooner rather than later. The sooner CPAs begin to use the portal to track CPE, the more streamlined their next renewal will be as they will minimize the need to reenter data. Additionally, two new fields including sponsoring organization and location of program have been added to the required tracking elements so the old form is obsolete by way of required content. In January 2011, the examination partners Prometric, American Institute of CPAs (AICPA) and the National Association of State Boards of Accountancy (NASBA) launched the latest Uniform CPA Exam update which included a time change for the audit (AUD) and business and environment concepts (BEC) exam sections. Effective January 1, 2012, this parnership announced for the second year in a row a reduction in fees paid by candidates. At its Annual Meeting, the following Board and Advisory Committee members were recognized for their service to the Arizona State Board of Accountancy and to the CPA profession. Board members have a five-year term limit. The Board continues to receive excellent support from its advisory committee members. Many advisory committee members serve more than one-five year term. Notably, Brian R. Lee was recognized for ten years of service and continues to serve. Also, BJ Morley and Douglas L. Ball have served on the Certification and Peer Review Oversight Committees respectively for the last five years and also continue to serve. The Board would not be able to fulfill its mission without the dedication of these advisory committee and Board members who give back to their profession and in turn help protect the public. Beginning January 2011, the examination partners Prometric, American Institute of CPAs (AICPA) and the National Association of State Boards of Accountancy (NASBA) will launch the latest Uniform CPA Exam update which includes a time change for the audit (AUD) and business and environment concepts (BEC) exam sections. Additionally, there will be a commensurate fee change effective December 4, 2010 but the overall cost of the Uniform CPA Exam essentially remains unchanged. The Peer Review Oversight Advisory Committee (PROAC) has published the following Matters for Further Consideration (MFC) list in an attempt to assist firms subject to an Educational Enhancement Review (EER). The MFC list addresses the most common findings discovered by PROAC during the EER and is broken down into four categories: Reporting, Presentation, Scope and management use only financial statement. The Firms tab, Peer Review page has more on firms providing non-disclosure compilation services. At its Annual Meeting, the following Board and Advisory Committee members were recognized for their service to the Arizona State Board of Accountancy and to the CPA profession. Board members have a five year term limit but what is remarkable is the fact that seven of the eight advisory committee members honored have committed to serve an additional five year term. In fact, several members have already served ten years and continue to offer their service. This speaks volumes about the dedication of these individuals in supporting the public protection mission of the Arizona State Board of Accountancy and their devotion to maintaining the credibility and integrity of the CPA profession. At its Annual Meeting, the following Board and Advisory Committee members were recognized for their service to the Arizona State Board of Accountancy and to the CPA profession. Board members have a five year term limit but what is remarkable is the fact that nine of the eleven advisory committee members honored have committed to serve an additional five year term. In fact, one member has already served fifteen years and continues to offer his service. This speaks volumes about the dedication of these individuals in supporting the public protection mission of the Arizona State Board of Accountancy and their devotion to maintaining the credibility and integrity of the CPA profession. A minimum of 40 hours must be in accounting, auditing, taxation, business law, or consulting services of which a minimum of 16 hours must be in the subject areas of accounting, auditing, or taxation.